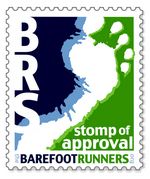 We are sooooo excited to see what the Canadian Running Magazine has to say about Barefoot Running and the whole Minimalist Movement. We are excited about working in this new category of footwear, and will remain committed to delivering the thinnest sole on the market. It will always have the best wet slip and durability with regards to abrasion resistance. Sockwa listens intensely to our customers with regards to what they like and don't like about us, as well as our competitors. There are many choices out there, but please choose responsively, and know that the best, most healthy way seems to be barefoot. Sockwa is 1.2 mm away from that. Thanks David for your kind words. I am so excited by this opportunity. Education is what this is all about and to be able to do this in a mainstream magazine is, I think, what is going to be a tipping point for our community.